Feathered Angels Waterfowl Sanctuary | Heaven on Earth for Domestic Ducks and Geese! Our mission is to help abandoned domestic ducks and geese with food, shelter and veterinary care; and facilitate adoption into safe, loving homes. 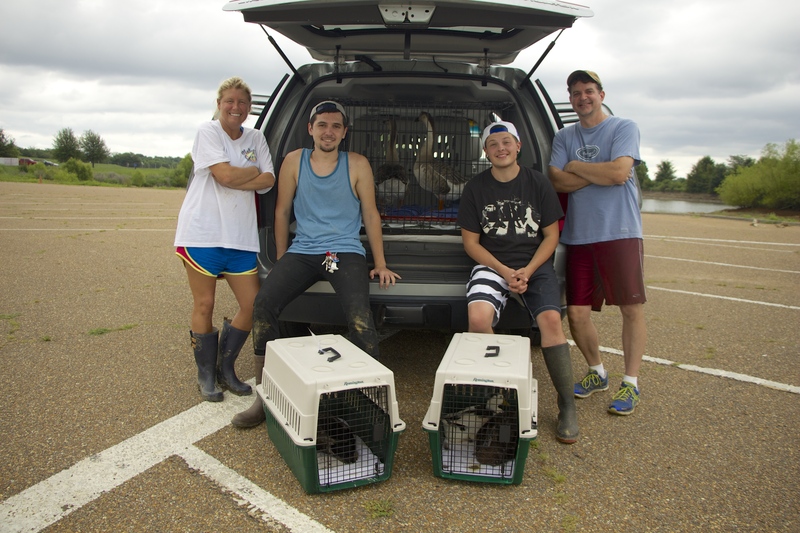 We promote education about domestic waterfowl to stop abandonment and assist owners with proper care. We are a 501(c)3 non-profit organization and all donations are tax deductible. 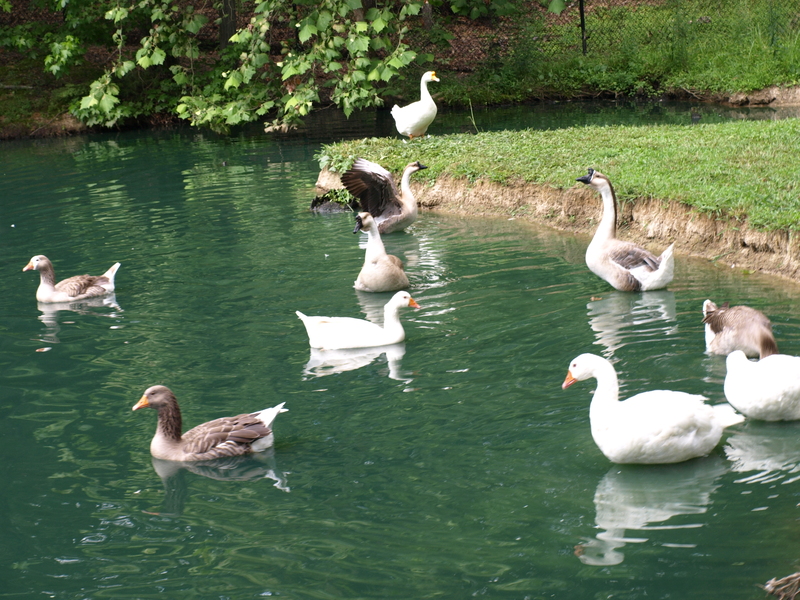 Domestic ducks and geese are often purchased as babies and once they grow up are released on local public ponds. They cannot fly thus move slowly and either starve or are killed by predators. Their weight to body ratio causes deadly foot infections (bumblefoot) on rocks and concrete. We take a group of volunteers, rescue them and take them to the veterinarian where they are examined for metal poisoning, injuries, bumblefoot and treated. We rehabilitate them and provide a safe home. Our sanctuary has a one acre pond enclosed in a 5 ft fence with electric (top & bottom) and extends 2 ft in the ground to keep predators from digging under. They have feeders and fresh water which is changed daily and eat the best available food (Mazuri). They have calcium and grit for hard eggshells and proper digestion. At dusk they all go into a barn with food & water to protect them from owls and the elements; then are let out each morning at dawn. Some of the birds are special needs with such problems as partial blindness, leg injuries from fishing hooks/line & recovered bumblefoot. Follow Buttercup as he gets a new high tech foot! They say “If it walks like a duck and quacks like a duck, then it probably is a duck”. But I am a duck, I REALLY am, even though I was not able to walk like a duck when I hatched on Nov. 9th, 2012. Hi! My name is Buttercup and when I hatched my left foot was turned backwards. My mom Chase worked with me to try and get it turned around but it only partially turned. I was adopted to my new home at Feathered Angels Waterfowl Sanctuary in January of 2013 where there are many ducks and geese! I was still hobbling around on my bad foot so my doctor, Dr. Shannon McGee recommended to amputate my foot. 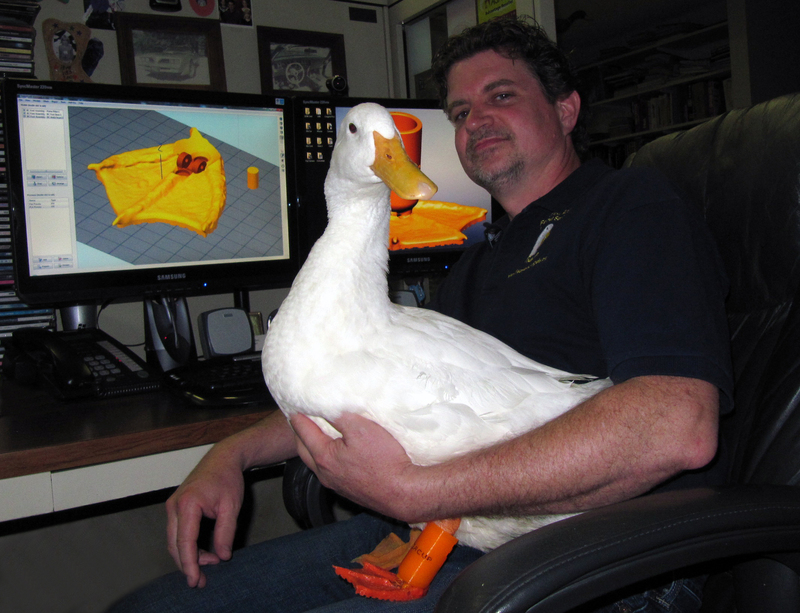 My Dad Mike created a new foot using the latest technology in 3D modeling and printing. Please follow my journey to becoming a “real duck” as I go outside and play with all the other ducks. Any support or sponsorship you can provide will be a big help! Visit my special page here! This is the reference book that duck-lovers have relied upon for years, newly revised with over 200 added pages! 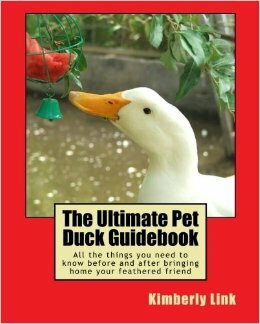 Covering everything you’ve ever wanted to know about your ducks in one comprehensive and pet-friendly guidebook. Written by the Founder & President of Majestic Waterfowl Sanctuary, a rescuer who understands the connection between pet ducks and their guardians, this guide treats your feathered friend as a loving and worthy companion. Based on first-hand experiences and containing answers to hundreds of questions, this guide covers everything from day-to-day care, to serious medical issues. You’ll learn essential tips on food, housing, flock management, safety, enrichment and lots more! Complete with inspiring anecdotes and an abundance of color photos and beautiful illustrations, if you have a pet duck in your life or are considering letting one join your family, this guide is an absolute must. Everything you’ve ever wanted to know about geese in one comprehensive, pet-friendly guidebook! This is the guidebook that goose-lovers have been waiting for! 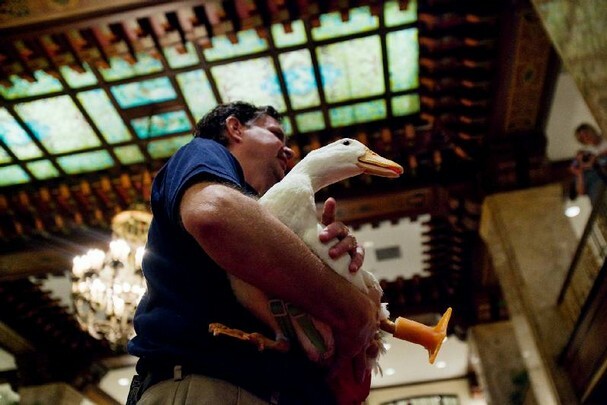 Written by the Founder and President of Majestic Waterfowl Sanctuary, a shelter entirely devoted to the rescuing of abandoned domestic waterfowl, this guide covers everything from day-to-day care to serious medical issues. Inspired by her own first-hand experiences, this guide is indispensable when caring for your feathered friends. 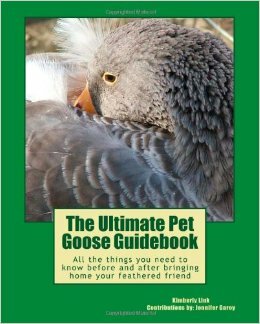 With over 150 full color photos, encouraging anecdotes and the answers to hundreds of questions, if you have a pet goose, this guide is for you.